IF YOU ANSWER YES TO ANY OF THE FOLLOWING QUESTIONS, YOUR DOG JUST MAY BE A BULLY. I HAD A BULLY DOG! LISA HELPED ME! 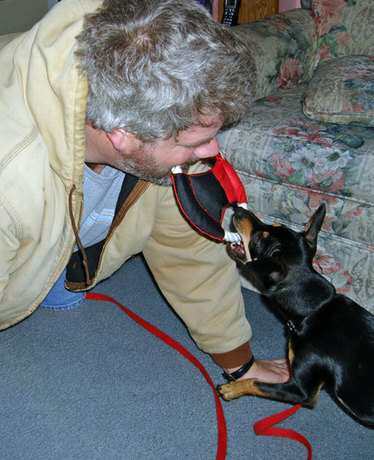 Lisa Freeman, AKA the Dog Whisperer of the Owosso, Michigan area specializes in working with aggressive dogs. She was the owner of an aggressive dog. Mean dogs can be trained, need to be trained, and should be trained before they hurt someone. WE HAD THE WORST DOG EVER! "Baby Ruth" pictured above was a bully dog too. Lisa took her home as a puppy, thinking she'd be the perfect dog to use in their Abuse Bites program. After all, she was born on 7/7/07 the perfect number, right? WRONG! This dog chewed everything up, barked uncontrollably, pulled hard on the leash, and wasn't potty trained until she was over a year old. She even got hit by a car because she bolted out of the house and ran away from Lisa instead of coming to her. "I wanted to get rid of her a million times," Lisa says. "But my son, Brian, who was always bullied for being different and loved and forgave his bullies, would say, 'Mom, you can't get rid of her. She'll be better if we keep loving her and working with her, you'll see.'" THANKFULLY I DIDN'T GIVE UP: Brian was the one that held and watched Baby Ruth during anti-bullying workshops. Sadly, Brian had a rare heart defect and passed away three years ago. But he was right--Baby Ruth did get better! Why? Because bullying and bullies can be retrained. Bullying is simply a behavior. With the right love and training all dogs and people can be better! Let's love our bullies! 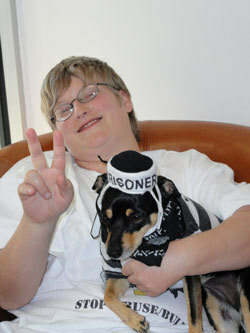 DON'T GIVE UP ON YOUR BULLIES--HELP THEM CHANGE! Today because Lisa Freeman listened to her son, and continued to love and work with Baby Ruth, she is active in the Abuse Bites Anti-Bullying program. First she wears her bully outfit, but then changes into a leather vest that says PAWS FOR CHANGE--to show kids, teens, and adults that anyone can change with the right love, discipline, and training. In Brian's memory they offer a CHANGE CHALLENGE during their workshop where all students are empowered to have a CHANGE OF HEART like Brian and BE THE CHANGE for others. Recent surveys show that these change workshops produce an 89% change rate in students to become proactive in fighting bullying! *Lisa Freeman is passionate about helping the bullied as well as the bullies. If you're in need of dog training or workshops for an upcoming event, contact her today for availability. She's currently offering one free training session per month at the Owosso Bark Park, Owosso, Michigan. For more details see her calendar and upcoming events.